An overwhelming 90 percent of people will complain that their head feels heavy at some point in their lives, and while heaviness in the head can be mild, it can be a cause for concern if it happens on a regular basis. Do you know anyone who has mentioned that their head feels heavy? Perhaps even you have experienced heaviness in the head. Some people say it feels like they can barely hold their head up, while others report that heaviness in the head is like having a tight band around their head. In the vast majority of cases, this feeling happens once and never again, or it is really mild. A small group of individuals gets severe heaviness in the head and tiredness, or heaviness in the head and dizziness on a regular basis. A feeling of head pressure can be linked to anxiety. When head pressure is intense and lasts a long time, seeing a doctor is recommended. There are situations where this type of head pressure is not linked to anxiety, but rather a common cold, a sinus condition, heavy drinking, or a migraine headache. A migraine headache is a type of headache that causes significant pain and normally begins with specific warning signs. For some people, it can be flashes of light or blind spots, while others experience dizziness, tingling legs, or arms, or feeling light-headed. There are also people who get heaviness in the head. Vertigo is another possible cause of heaviness in the head. Vertigo is a sense of dizziness or loss of balance, especially when an individual moves the position of their head or goes from a lying to sitting position. While many people experience fatigue, some people feel constant exhaustion and along with it a heavy feeling in the head. This could be a sign of an underlying health issue, such as kidney problems, liver issues, heart disease, diabetes, cancer, anemia, or chronic fatigue syndrome. If you have recurring heaviness in the head and tiredness, you should seek medical attention. Lastly, if you experience whiplash, then you may experience a heavy head. Whiplash is when the muscles and ligaments of your neck reach beyond a point of normal range of motion. The most common cause of whiplash is experiencing a car accident. It may also cause due to amusement park rides, abuse, falls, or sports injuries. The signs and symptoms of heaviness in the head largely depend on what is causing the problem. For instance, in the case of a migraine, it is common to have pain on just one side of the head, along with sensitivity to light and sound. In the case of fatigue causing your heavy head, you will notice that you feel exhausted. In many situations, it becomes a vicious cycle because you are exhausted and start to worry about being tired all the time, thus adding anxiety to the mix. Oftentimes, anxiety leads to insomnia. When anxiety is the underlying cause of heaviness in the head and tiredness, you can experience irritability, shaking, sweating, restlessness, heart palpitations, dizziness, and diarrhea. Researchers at Queensland University in Australia report that one in 13 people worldwide suffers from anxiety. A lot of people will not require treatment for heaviness in the head simply because they experience a mild episode once, it goes away, and that is it. If your heaviness in the head happens on a regular basis and involves severe, uncomfortable symptoms, treatment is necessary. It is important to tell your doctor about every sign and symptom you experience. Many people find it helpful to write down what they experience in a journal so they can discuss it later with their doctor. A discussion and physical exam can often help a doctor determine the root cause of the heavy feeling in your head. However, sometimes a specialist, such as a neurologist, is required to diagnose and treat you. To help determine if a serious issue is causing the heaviness, an MRI, CT scan, or possibly a spinal tap could be ordered. In terms of treatment, pain relievers or triptans might be prescribed to help treat migraines. Vertigo may be treated with something called a canalith repositioning procedure, which consists of several simple head maneuvers. Vertigo could also involve surgical intervention. 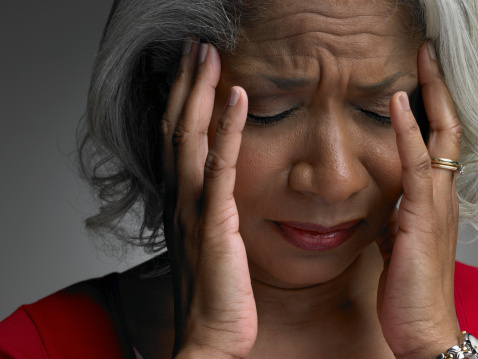 For individuals who experience frequent tension headaches due to anxiety, medications to help prevent attacks may be prescribed, including muscle relaxants, tricyclic antidepressants, anticonvulsants, or other types of antidepressants. It is important to understand that many of these medications can have side effects and can take several weeks to actually make their way into the body and start working. There are home remedies for heaviness in the head that people can turn to as an alternative. In the case of anxiety and tension headaches, visualization can be helpful. Visualization is directing one’s concentration on images held in the mind. In this case, you would begin by closing your eyes and feeling the heaviness in your head. You would then imagine what it would feel like to have someone lift a lid off your head and let the heaviness escape. You may have to repeat this several times before the heaviness feeling actually goes away. In cases where there is an underlying health condition, visualization won’t help your heaviness. The technique is a tool that can be very effective in situations where the feeling of a heavy head is due to fatigue and mental stress. Perform a chin tuck exercise, where you stand with your back to a wall and slowly move your chin downward to feel a stretch at the back of your neck. Hold for five seconds and return your head back up look forward. Repeat a few times. Perform a back-burn exercise, which is done by standing against a wall with arms outstretched at shoulder height, palms facing forward. Slowly bring your arms upward close to your ears. Then slowly bring them back down. Repeat 10 times. If you have regular heaviness in the head and have no success with home remedies, then you should see a doctor. There is no reason to suffer and you need to determine what the underlying cause of the heavy head is. An isolated heavy feeling in the head is usually nothing to worry about. In fact, it is forgotten as quickly as it comes and goes. When people experience a heaviness in the head on a regular basis, along with other symptoms like dizziness, fatigue, or vomiting, it is not only uncomfortable, but it is concerning. If you or someone you care about gets recurring heaviness in the head, start by visiting a general physician who can either quickly diagnose and treat the heaviness or refer you to a specialist who can.